MILWAUKEE — In a horrible twist of fate during this already difficult week, another City of Milwaukee worker was killed. It's the second death of a public worker in just three days. Wednesday, Milwaukee Police Officer Matthew Rittner was shot and killed in the line of duty. On Friday morning, Bryan Rodriguez, an employee with the Department of Public Works, was fatally struck by a car. The driver took off. TODAY'S TMJ4 spoke to a close friend of the victim, who says Rodriguez was a hard worker. He was always willing to help others. He was a father and grandfather, who loved his family more than anything. 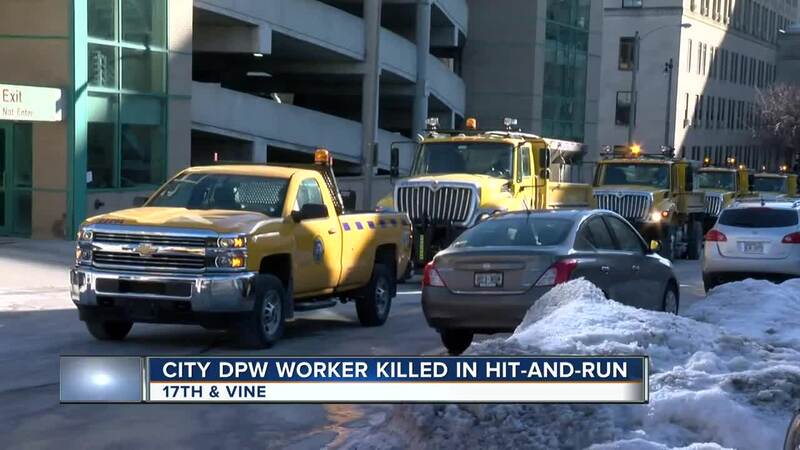 "He was filling a pothole, standing directly behind the DPW truck, following normal procedure, when a car hit him and the truck," said Milwaukee Mayor Tom Barrett. The driver took off running, leaving the car at the scene on 17th Street between Walnut and Vine. Not even checking on Rodriguez. Milwaukee Police have one person in custody for the crime, but they say it's still a very active investigation. If you were in the area when the hit and run happened and saw anything, they urge you to call 414-935-7360. "This is a very rough day," said Jeff Polenske, a City Engineer with the Department of Public Works. "You never expect something like this to happen. In these tough times, our condolences certainly go out to Bryan's family, friends and coworkers." Coworkers escorted his body from the hospital to the Milwaukee County Medical Examiner's Office. His wife and children were there to witness that procession. "It's a sign of respect," Barrett said. "Something that is done every work day, should not result in the death of an individual." Easter Dethrow is a pastor at a church just steps from where Rodriguez was killed. He says the driving in this area has gotten out of hand. "They drive like they are on a highway," he said. "A lot of times I just pull over and let them pass me. They're on their phones. They're in a rush, not paying attention. It's dangerous. And for it to end in something like this is heartbreaking." The death of Rodriguez is the latest loss in a painful two years for the city. Three Milwaukee police officers have been killed in the line of duty in the past eight months. Back in 2017, city inspector Greg "Ziggy" Zyszkiewicz, and crossing guard Andrew Tyler were also killed on the job.